I'm going to warn you now. This one is going to be long because there is a LOT to discuss about Colin Baker and two of the stories I will be covering today. Colin Baker's Tenure of Season twenty one was a single four-episode story that ran from March 22-30 1984. This was the debut of Colin Baker as the Doctor. It was the first time a Doctor had regenerated mid-season since Hartnell regenerated into Troughton. Now, Colin Baker's rise to becoming the Doctor was an interesting one. He played Commander Maxil in the previous season and became friends with the production crew and due to that friendship he was invited to a wedding. At the wedding he entertained the guests so much what they thought he would be the ideal man to be the next Doctor. He was then hired without an audition. He was also one of the few Doctors who had no say in his costume. 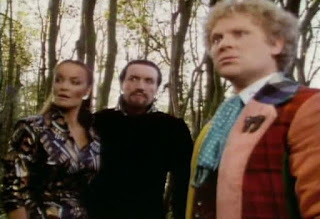 Colin Baker wanted to dress in all black and be suave but John Nathan-Turner overruled him and he got that outfit. His goal was to be the Doctor for eight seasons so that he could beat Tom Baker's record. Unfortunately that was not going to happen. It's as if his stint in season twenty one was a sign. The problem with season twenty one is that his story, The Twin Dilemma was abysmal. It was poorly received due to some of the decisions made and to this day carries the reputation of the worst story of the classic era. To top matters off this was the season finale meaning that the general public would have to stew on this terrible story from April till January before getting to see the 6th Doctor again. Things didn't go well. Season twenty two ran from January 5, 1985 till March 30, 1985. It consisted of thirteen 45-minute episodes across six stories. Season twenty two is bad...very bad. Confusing production decisions abounded left and right and even the absolute best story from this season is just ok. This has nothing to do with Colin Baker as the Doctor; it's all to do with behind the scenes, writing, and budgetary nonsense. For some reason the production crew really enjoyed the run time of Resurrection of the Daleks from last season and made this entire season be 45 minute long episodes. However the writers didn't necessarily change their mentality on the episodes with this new edict which made for some bad choices as well. With the standard 25 minute episodes, generally the Doctor would get involved in the story at the end of the first episode. For some reason many of these stories retained that idea meaning half of the story was over before the Doctor was even invested in helping out. Most famously is Revelation of the Daleks where the Doctor and Peri walk around in the snow for 45 minutes. Due to how horrible this season was, the BBC put the show on hiatus after this season and ceased work on the planned season twenty three. Colin Baker's first story is the Twin Dilemma and it's four episodes long. A Time lard named Azmael has kidnapped twins who are mathematical geniuses. Meanwhile the Doctor is having a very bad stint of post-regeneration mania which takes the form of random cowardice, random outrage and even almost choking Peri to death. The twin's father alerts the authorities and an officer tracks down Azmael's ship but crashes on the same planet the TARDIS is sitting on. 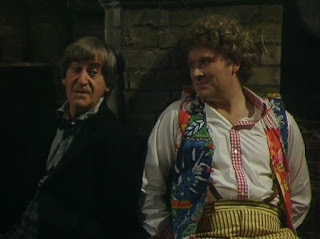 After helping the officer, the Doctor and Peri infiltrate a building on their deserted planet which shouldn't be there. There they find Azmael and the Doctor remembers him as a friend when he was the 4th Doctor. A bird like alien with Azmael ushers the time lord and the boys into a teleport to take them all to the planet of Jaconda. He then locks the teleporter and sets the place to self destruct. The Doctor figures out a way around this teleportation lock and escapes to the TARDIS where he intends to track down his friend. It turns out that Azmael is working under duress for a slug alien named Mestor who intends to utilize Time Lord technology and the twin's mathematical minds to explode the planet of Jaconda in order to spread his offspring's eggs and conquer the entire galaxy. 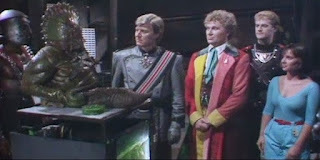 The Doctor and Azmael eventually confront Mestor and the slug takes over Azmael's body. The Doctor destroys Mestor's body so that he cannot return, and Azmael who is on his last regeneration, forces a regeneration to kill Mestor's mind and himself with it. I understand what they were going for here. There's something decent hidden deep within all the amounts of terrible. I kinda of like the idea of the slug sending it's eggs all over the galaxy and I thought Azmael's death sequence was actually touching. That said... this IS terrible. It's reputation as the worst story is well earned. I could go on all day about this but I'll just make a short list of all the things wrong with this story. The Doctor is on and off unstable throughout the entire four episodes, the Doctor strangles Peri, the child actors not only have a speech impediment but are not good actors whatsoever, there is insane amounts of Macguyvering going on with the teleporter, planetary physics that would never work, and the slug monster looks terrible. This story is one of the reasons that the 6th Doctor was not very popular. While other Doctors like Tom Baker and Peter Davison did have some post regeneration madness going on it was only briefly or for one episode. Colin Baker's mania was throughout the entire thing. Now this (and honestly him strangling Peri) may not have been bad ideas if this were the first story of a season. They were a bold move that might have paid off if we'd get an immediate look at how this Doctor ACTUALLY reacts in the very next story the next week. Unfortunately all we got was about five minutes of him being the true 6th Doctor and the public was stuck with this mental image of a cowardly maniacal and violent man for almost a full year before seeing him. This was a bad bad bad decision and a bad bad bad story. Diamanda Hagan said it best. "When it comes to the Twin Dilemma the only dilemma is whether to burn your copy or keep it as a warning for the future." The first story is Attack of the Cybermen and it's two episodes long. The Doctor begins working on the TARDIS to fix the chameleon circuit when he receives a distress beacon and lands on Earth. The beacon was set of by Lytton, the former Dalek agent, who is underground and looking for the Cybermen. Meanwhile on the Cybermen's adopted home world of Telos two men behead a Cyberman and plan to infiltrate Cyber Control in order to get their time machine back. Eventually the Doctor and Peri find Lytton but the Cybermen are with him and force the Doctor to take them to Telos. They arrive in the frozen tombs of the Cybermen where Lytton escapes to find the two men and their time machine and Peri is rescued by the Cryons. The Cryons are the natives of Telos who must live in subzero temperatures and want to Cybermen to leave their planet alone. It turns out that Lytton was actually working for the Cryons to stop the Cybermen's plan of using the time machine to stop the destruction of their homeworld Mondas. Lytton is captured by the Cybermen, tortured, and set up to be converted. The Doctor learning the truth of Lytton sets up a series of eventual explosions and tries to save Lytton but is too late. In the end the Cyber Controller is killed in a crossfire and the explosions wipe out Cyber Control and the tombs. This is another episode that many people don't like but I think is quite good. One silly thing about it, however, is that they try to keep up a mystery as to what has been killing people underground forgetting that the title of the story is Attack of the CYBERMEN. This is sort of a sequel to a majority of Doctor Who in general as it features or references Totter's Lane (An Unearthly Child) Lytton (Resurrection of the Daleks), the destruction of Mondas (The Tenth Planet), Cybermen in the London Underground (The Invasion) as well as a few others I'm possibly missing. It's also really cool to see the chameleon circuit sort of working and making the TARDIS look absolutely ridiculous... though it does revert back to permanent police box by the end of the story. The last noteworthy thing is the Cryons. I love the design of the Cryons because it's effectively a whole race of subzero moustached fish lesbians.... and that's just great! Check this one out if you want a good laugh or two. The next story is Vengeance and Varos and it's two episodes long. The TARDIS is running low on a particular mineral that is abundant on the planet of Varos so the Doctor heads there. Varos is a very poor planet who's idea of democracy is to vote on everything even people's deaths. Televised deaths and mineral working are about the only things to do on the planet. The system is crappy and the governor is trying to do the best he can to make it better... at least until the popular vote is to kill him and the next one tries the same. The people of Varos are being severely underpaid for their rare mineral by the evil Sil. They are so poor that they have resorted to selling tapes of the torture and death of people who break the law. The Doctor, Peri, and some revolutionaries have to make their way though the psychologically torturous Punishment Dome and attempt to help the current governor seize control back of his planet, learn the worth of his precious minerals and be out from under the oppression of Sil. There more going on in this story than I really mentioned such as Peri being slowly turned into a bird, lots of torture, and Sil's overall plan. It's a strange story but it's actually ok. I personally believe this is the closest to good that the Colin Baker era ever saw (though some people would disagree and say Revelation of the Daleks is better.) The story has an interesting spin on democracy and the "popular vote" as well as introducing the single best character outside the Doctor and Peri... Sil. Sil is a slimy overly bloated take on extreme capitalism and he's an absolute treat to watch. Check this out for Sil if nothing else. The next story is The Mark of the Rani and it's two episodes long. The TARDIS has landed in 19th Century England due to a time distortion. The Doctor and Peri run into some crazed miners with a strange red mark and seek refuge at the local village. Meanwhile the Master has shown up and immediately finds an old woman who is actually another Time Lord in disguise known as The Rani. The Rani has been luring miners into a bath house, draining the chemical needed to induce sleep from their brain and letting them go; this results in their aggressive behavior. She needs these chemicals because of her experiments on the the planet she controls has caused the population not to be able to sleep. The Master convinces the Rani (by stealing some of her brain fluid collection) to help him destroy the Doctor. They capture the Doctor but he escapes thanks to inventor George Stephenson. Stephenson plans to have a meeting of all the most brilliant minds in the village but the Master plans to use this to further Earth's technological advances and eventually use Earth as a base of operation. Meanwhile Peri is using her botany expertise to create a sleeping draft for the miners. Eventually the Doctor sneaks into the Rani's TARDIS, retrieves the stolen brain fluid, and sabotages it causing the Master and the Rani to be hurled away from Earth. The Doctor then give the brain fluid to a local doctor so that the miners can return to normal. This one is very hard to pin down. It has some really great moments but some really dull and terrible moments. The Rani is excellent in this story. She's completely amoral and only cares about her research. There's also a really horrifying part of this story that sounds stupid at first but gets worse when you think about it. The Rani lays land mines which turns people into trees if you step on it. However they are fully conscious of their condition, cannot sleep, cannot call for help, and are just standing around in a forest waiting for one day to be chopped down which may not happen for several hundred years. The Master isn't well used here. Usually he's at the center of all things evil but this time he's more around to just be an annoyance to the Rani. This also includes one of the more noteworthy cliffhangers for the fact that it was bullcrap. The Doctor is strapped to a table and tossed down a mine shaft. At the end of the first episode we see the table being to fall into the mine, but at the beginning of the episode he is rescued long before he gets near the mine opening. If the Rani sounds interesting to you then give this a watch because this is the only time she's any good. If not then feel free to skip. The next story is The Two Doctors and it's three episodes long. The Second Doctor and Jamie arrive on a space ship with orders from the Time Lords to have the ship stop their time experiments. However one of the shipmates signals a team of Sontarans to the ship and she, the scientist, the Sontarans, and the chef kidnap the Second Doctor. The Chef and the woman are both Androgums, a race of space gourmands who are obsessed with eating any and all meat they can find across the galaxy. The Sontarans plan to use the Doctor's knowledge to allow them a working time machine while the Androgums and scientist intend on double crossing the Sontarans and getting the machine for themselves. The Sixth Doctor collapses and sees a vision of his Second self dying and goes to the ship where he last felt his presence. There they pick up a confused and distraught Jamie. The Doctor concentrates on his memory and remembers hearing the bells in Seville, Spain. The three go there and infiltrate the base to save the Second Doctor. Unfortunately, the scientist has given the Second Doctor a large dose of Androgum DNA and he starts to turn into one. After a lot of running around, double crossing, sabotage, the Androgum almost eating Peri, and the mutated Second Doctor and Androgum go into town in search of food, the Second Doctor's body rejects the DNA and returns to normal. 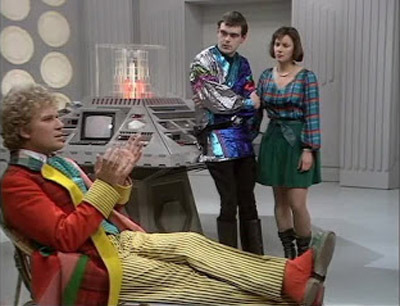 Eventually both Doctors, Peri, and Jamie stop the Androgums and destroy the time machine. The Second Doctor uses a TARDIS recall device and he along with Jamie fly off. This story....OOOHHH this story. This story is the only non-special to have more than one Doctor featured in it. It has two fantastic Doctors, two fantastic companions, there was location shooting, and it was written by Robert Holmes who wrote many of the greats of the show. They practically had this gift-wrapped to them to be awesome but it was mishandled by stupidity and screw-ups in a major way. 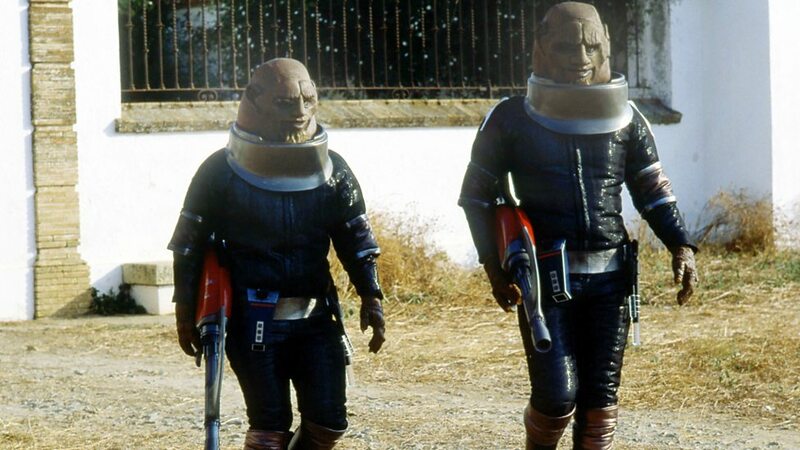 The first problem is the Sontarans...not only are the pointless and don't really add anything to the adventure but they look absolutely terrible. Someone also must have forgotten that they are supposed to be a clone race as the two actors are clearly nowhere near the same size. This story also fails in a major way. 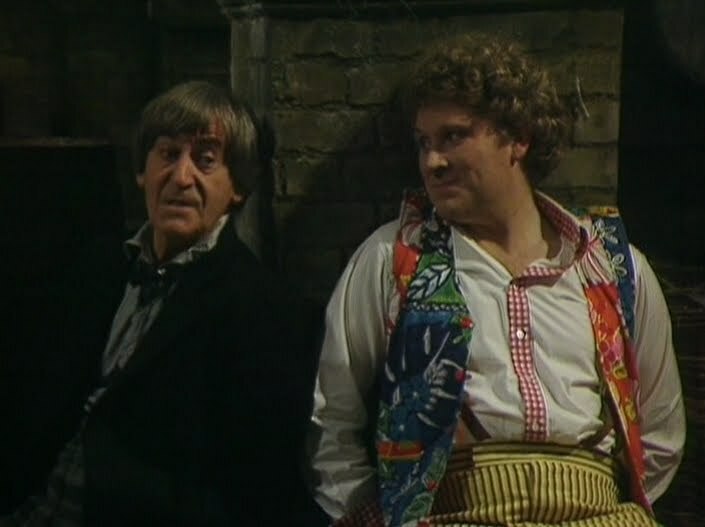 One of the big sticking points is that the Second Doctor is slowly turning into an Androgum and the Sixth Doctor is trying to stop this and save himself. The problem is that there is no dramatic tension here because the Third, Fourth, Fifth and Sixth Doctors are not Androgums. They also had to come up with constant reasons why the Sixth Doctor couldn't remember where he was when he was the Second multiple times throughout the story. What SHOULD have happened was the Sontarans not being present at all, the Sixth Doctor being kidnapped and turned into an Androgum, and the Second Doctor, Peri, and Jamie had to go on the rescue that way they wouldn't know where he was at all and there would be a legitimate threat. As is, this story is really really bad and I hate saying that because it's the last time we get to see the great Patrick Troughton and Frazier Hines. This story DID however bring about one thing absolutely wonderful to Doctor Who as a whole aside from seeing the Second Doctor and Jamie. That, ladies and gentlemen would be Season 6B. When Robert Holmes wrote this, he wasn't sure which of the Doctors was constantly sent on missions by the Time Lords and just assumed that he had always done so. The Doctor Who fandom came up with a theory that isn't perfect but it works. 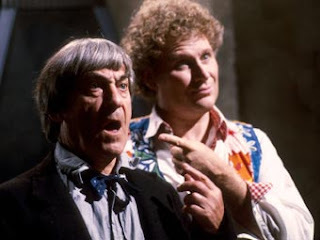 We never see the Second Doctor actually regenerate into the Third Doctor...we just see him fade away and Jon Pertwee falls out of the TARDIS. The theory states that the Doctor was pulled out of his execution and forced to do work for the Time Lord secret service so that they wouldn't get their hands dirty by using an exiled Time Lord. Once they were done with him they placed him back in his proper time and was executed. This would explain his presence in the Three Doctors, The Five Doctors and here more easily without using some time babble. It would also explain how he has a TARDIS recall device in this story that the Sixth Doctor says he's "always wanted." Again, it's not a 100% perfect theory but it's better than anything the show gave us and the BBC has sort of accepted it as canon. Anyway, check this out if you want to see Patrick Troughton and Frazier Hines although be warned you're in for something terrible. The next story is Timelash and its two episodes long. The TARDIS lands on the planet of Karfel which is run by the evil Borad. The Borad sentences people who cross him to be tossed into a time corridor that leads to 1883 Scotland. Peri is kidnapped and sent to a cave to be eaten by the reptilian Morlox if the Doctor doesn't go into the Timelash and recover an amulet necessary to transfer power on the planet. The Doctor does so and runs into HG Wells. Wells accompanies the Doctor to Karfel where they eventually run into the Borad to find that he is a hideous half-man half-Morlox. The Borad intends to cause a war against another planet in order to kill all the people of Karfel and start up his own society of Morlox and half-morlox. He then sets off some gas to turn Peri into a half-morlox. With the help from Wells, the Doctor saves Peri and stops the ongoing war. The Borad eventually falls into the Timelash where the Doctor theorizes he may eventually become the Loch Ness Monster. This story is very bad. The design work and the script are just not that good. What is good about the story is the strange nod to Jon Pertwee as there is a mural from his first visit there.. a visit we've never seen. Also the makeup on the Borad is amazing. It's some of the best makeup work in the show's history. It's also weird to have two historical famous people in the same season, the first was George Stephenson in Mark of the Rani. All good points aside this story is bad and I don't really recommend it. The last story of the season is Revelation of the Daleks and it's two episodes long. The TARDIS lands on the funeral planet Necros because the Doctor is looking for an old friend. While there he is attacked by a mutant which Peri kills. Before he can die, he explains that he is the result of experiments by the Great Healer. The Great Healer is actually Davros who has set up shop to turn the dying people in suspended animation into Daleks loyal to him and him only. The rejects he then chops up into food and provides to a food distributor for famine relief. The distributor is ready to be done with Davros' dealings for good and hires two assassins. It is also found out that the friend the Doctor has been looking for is in the process of being transformed into a Dalek. Eventually, the Doctor and the assassins meet up with Davros but forces from Skaro have landed and an all out Dalek Civil War is taking place. 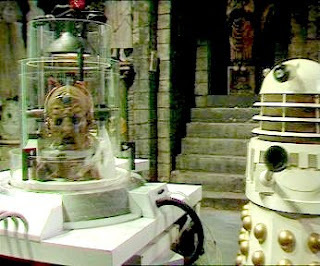 The Dalek Supreme's forces win and take Davros back to Skaro for trial. Many people prefer this story to Vengeance on Varos and I can see why. It's very dark, the assassins are a nice double act, and there is a lot of comedy thrown in the dialog. One notable thing is that Clive Swift (Richard from Keeping Up Appearances) plays a role in this story. Unfortunately despite all of these good things, I think this story is a bit of a mess. There's some junk about a tombstone with the Doctor's face that makes no sense at all, the Radio DJ is beyond annoying, and the Doctor and Peri don't even get into the thick of the problem till the second episode. Yes, they spend 45 minutes just walking around in the snow for absolutely no reason. You may enjoy this more than I did...it's not terrible because of the comedy and the darkness but I just don't think it works that well. That was seasons twenty one and twenty two. I was probably being more kind to these stories than I should have. These stories were mostly bad...very bad. 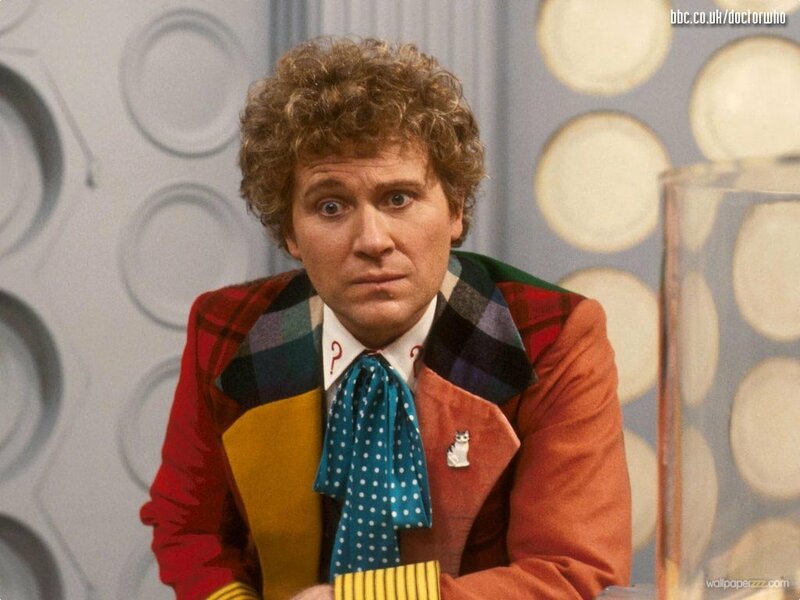 It's a real shame too because Colin Baker was a very strong and very capable Doctor. John Nathan-Turner was not wrong to have cast him for the part. He was just very badly handled with awful stories. It was during this time that the BBC had it in for the show and as such the next season was cancelled. We'll talk about what happened after that next time. Please join me again as we continue to examine all of Doctor Who.